It was dark in the bay and the moon hid its face as something broke the surface of the oil slick blackness that was the lake above the valley of Mirkywood. Only moles would have detected movement in the predawn darkness though it was well that they did not else they must be silenced. For surfacing in the lake was none other than the dashing yet deadly hero Austin Powys, International Hobgoblin of mystery. He had arrived in the air above the valley with a little help from Yew Branch in the form a long distance single Hobgoblin glider. Once in position he had detached his harness and fallen through the air with no parachute, silent and unseen. He’d calculated that the lake was deep enough for him to land safely in. The descent had been tricky, a careful balance to splashdown both safely and quietly, of course for Austin this was child’s play. The lake was on the head on a deep wide valley. Looking down at what lay below, Austin could see the workings of a terrible base of operations... Evil devices powered by the black river that rotated cruel machines which whipped chained hobgoblins to pedal faster on mill wheels which in turn pumped bellows that breathed fire like that of Dragons breath into the great forges below the ground. As Austin surveyed the scene through special lenses, making everything seem closer - another Yew Branch gadget - he noticed an air balloon, grounded and reinflating. However, it was no ordinary balloon, it was marked with a stylised bat-style winged logo, an indication of his own race perhaps? As he looked down, Austin saw through the great deception. He had found remains of what seemed to be small bags of sand dropped at the scenes of the attacks. Austin realised the great flying beast was no Dragon but a hot air balloon dressed up as one. Wogan’s intelligence network had triangulated the destination of Dracci's lair based on the most recent sightings and now Austin had found it. It was here, moored above Murkywood near the ill-starred town of Tarrwen Harbour, which no-one would approach for fear of monsters and ghosts. Austin quickly made his plan. He thought of doing the usual - rescuing the people, stealing the balloon and flying off into the sunset. However, this villain, this Hugo Dracci, had attacked the mines of Taffsea and taken it’s people. He had attacked the very veins of what made Taffsea great. This was personal. This time he wished to slay the dragon literally. He wanted to seek out Hugo Dracci, take measure of this new unknown foe and best him. This was outside his brief but after Coalfinger Austin had had his fill of these despots. Dracci with his winged terror would be made an example of. No one tortured Taffsea with impunity. In previous adventures Austin would have freed the slaves and had an instant army. The slaves here, however, are too weak to be of use in such a role. If they were freed they would most likely be slain by Dracci’s Hench-Orcs. Powys must search each building in order to find and silence Hugo Dracci. Austin is an Experienced Elite Light Troop Hobgoblin, choose skills as per the standard rules for his experience level. Austin’s 'charm' ability only works on ladies and as such is not used in this adventure. This new unknown enemy is believed to be a true ‘Child of the Dragon’. The Dracci, believed lost from Valon in this era of blackpowder, are a powerful race from the East. He should be represented on the table by any of the Dracci Lord models. Hugo’s stats are described in the Special Rules section below. Along one edge of the board is the great river Dewy, along the other is the steep side of Llednevir Hill (now a mountain since that nice Orc from Albion, Huw Grunt , reclassified it). No figure can leave via either edge. You should setup the table with a number of buildings in the valley, some with great mill wheels and others with rows of chained slaves attached. You should also place a model representing the Dragon styled hot air balloon at the opposite end of the table to the one Austin enters from. 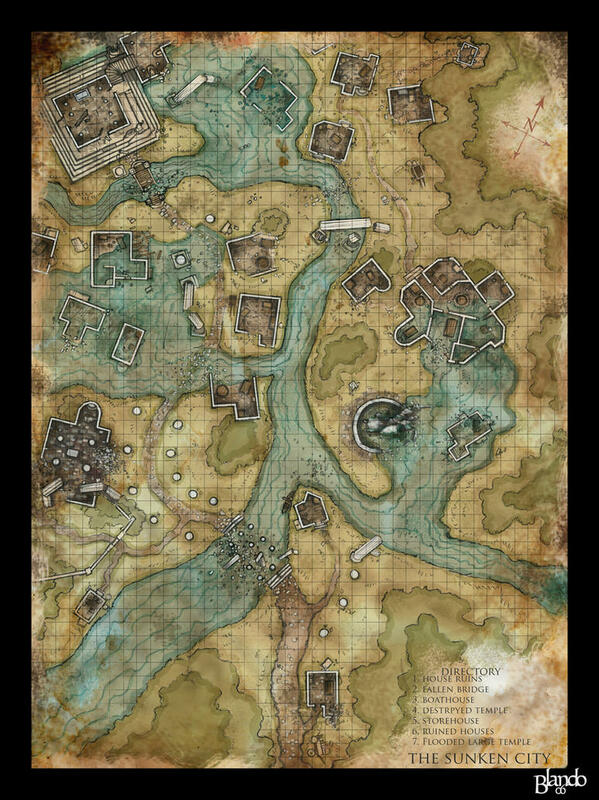 Whilst playtesting this adventure I used the excellent map – The Sunken City by Stormcrow135 – to represent the valley. I randomly chose six buildings as potential hiding places for Dracci and marked them with tokens. Hench-Orcs: There are a number of Bog Orc guards in the base. The exact number is up to you allowing you to set your own difficulty depending on what miniatures you have in your collection. They should be placed randomly using any method you wish (I divided the table up into 10 x 10 rough sections and rolled a D100 for each figure). Before the alarm is raised they do not move. Each Bog Orc has a chance of spotting Austin if they see him and will move to engage. Simply roll D100 and if you roll over the number of cms away from the Bog Orc then Austin is seen. i.e. Austin moves through the LOS of an enemy 32cm away. Roll 1D100. If you roll 33-100 Austin has been seen and the Bog Orc will raise the alarm. “Alarm!”: Once the base is alert things get rather tricky for out erstwhile hero. All of the Hench-Orcs on the table are now controlled by the Solo Play rules (Flintloque: WIC, p.89). They are all Bog Orcs armed with either a pistol (01-25%), Musket (26-75%) or Sword (76-100%). Their ratings are determined as per normal using the drawn tokens method, as are their actions. The Alarm is cancelled if Austin spends two consequtive turns out of sight of all Hench-Orcs. “Honestly, it’s not mine...”: The inflatable life size model decoy can be used to get Austin out of trouble. If Austin is engaged in melee combat by an enemy that started the turn out of his line of sight the enemy has in fact found the decoy, Austin himself having slipped away silently. Simply move Austin up to 10cm from his original position anywhere he is out of any enemies line of sight. Hugo Dracci continues to use the Dracci Lord movement stats but now fights as an Experienced Irregular Goblin. When Dracci’s true nature is revealed each Hench-Orc has a 50% chance of being so embarrassed by this secret truth that they will sneak away from the fight, remove them immediately from the game. The other 50% recognise the fact that, Child of the Dragon or not, Hugo Dracci is still very very rich and will pay handsomely for any assistance in defeating Austin Powys. For Austin Powys - When Hugo Dracci is Out of the Fight or otherwise removed from the table. This scenario was written at the behest of Mr Andrews for St David’s Day 2013. It is in many ways similar to Austin’s first adventure, Thunderballs Up, in which he fights the nefarious Lastrom Burgundy but many people had mentioned that Austin easily over-powered Burgendy’s Hench-Elves. Hugo Dracci’s Bog Orcs might be a bit too much in the other direction but the life of an International Hobgoblin of Mystery is not meant to be an easy one. As with all my scenarios feel free to change and adapt it in any way, the main aim is to have fun! An Orcs in the Webbe Original! "Skyrimfall" was written exclusively for Orcs in the Webbe and was first published on the 1st March 2013.